Although the efforts from the “Leave” side to defend the legitimacy of the result are all cogent enough, they are usually content to address the “Remainers’” objections on their own terms instead of challenging the underlying assumptions. This short essay will attempt to provide some additional, more fundamental ammunition in order to refute the most typical arguments. This observation is usually deployed in order to suggest that the older generation have, in some way, sealed the fate of the younger generation which will have to live with the consequences of Brexit for longer. Consequently, so the argument goes, the votes of the “young” should be given more weight than the votes of the “old”. The usual response to this argument is that democracy works on the principle of one citizen one vote, and that the votes of the older generation are just as valid as the votes of the young. All well and good. However, it overlooks the more basic fact that nobody knows precisely who voted for either “Leave” or “Remain”. The referendum, just like a general election, was a secret ballot. The only question asked was “Leave” or “Remain”. There were no separate boxes to tick in order to match your vote with your age, ethnicity, education, income status or whatever. Except for the geographical distribution of the results, which we know only for the logistical reasons of counting and reporting, the only thing that is known with certainty is how many people voted for “Leave” and how many people voted for “Remain”. All other “information” on precisely who voted for which way is an extrapolation either from polls, which were not the vote itself, or from attempts to match demographic data to the concentrations of “Leave” or “Remain” votes in specific areas. It seems that we scarcely need to mention how inaccurate polling can be given its most recent, high profile failures. But one of the reasons for these inaccuracies is that polling favours the more vocal and passionate voters on each side – i.e. those who are dedicated enough to be put their names to their decisions, and who may not be representative of the critical mass of less dedicated voters. The latter may either wish to remain private or they simply have better things to do with their day than chat to pollsters. Further, it is usually the case that removing the secrecy that is enjoyed during the actual ballot grants a bias in favour of the “fashionable” or “acceptable” view, which in this case was, of course, “Remain”. This is true enough for older adults, but it is likely to be especially true for under 25s, for whom the weight of peer pressure and the desire for social inclusion is felt more pressingly compared to their older friends and relatives. In the seclusion of the voting booth, however, there are no inhibitions against voting precisely how you want. Polling data may, of course, help us to understand the vote, but it does not grant any legitimacy in order to undermine it. The only thing that is known for certain is which side won and which side lost. Thus, the only legitimate basis on which the government may proceed is to implement the wishes of the side that won. This argument is used to point out the fact that the statutory instrument making provision for the referendum to occur did not place any legal burden on the government to enact the result. Consequently, so “Remainers” say, the duly elected representatives of the people should muse over or “ponder” the result before doing what they “think is best” – which, of course, means “Remain”. The usual response to this argument from the “Leave” side is that the government promised to implement the outcome of the referendum, which is entirely true. The more incisive argument, however, is that raising the “advisory” nature of the referendum’s outcome confuses legal technicality with political legitimacy. When, however, the electorate is asked one, very specific question concerning one, very specific issue then the government of the day, which derives its authority from the will of the people, cannot ignore that decision. Indeed, to do so would, in fact, bring into question the entire basis of the legal system under which the vote is technically “advisory” if that technicality can be used to ignore the wishes of the people. Moreover, it is one thing to suggest that the elected representatives are voted in to decide “what is best” for the country when those decisions concern matters such as the rate of taxes, the apportionment of government spending, etc. It is an entirely different thing to suggest that parliament may delegate its decision making authority to supranational bodies, the legitimacy of whose governance is derived from the will of foreign peoples more than it is from the will of the British electorate. For that kind of decision, Parliament must surely seek the direct authority of the British people. This argument is most often used to point out that places such as Scotland and London voted heavily in favour of “Remain”, and are thus being bound by “leavers” in far flung places who have nothing to do with them. It is true, as we mentioned earlier, that we know for sure how each region voted, even though, as we also pointed out, this is only for the purposes of counting and reporting, and is not supposed to make any difference to the final result. The problem, however, is that neither London nor Scotland voted by themselves for anything that affects only either London or Scotland. The question asked in the referendum was whether the UK as a whole should either remain in or leave the EU, and the UKas a whole voted for the UK as a whole to leave. “London” was never asked if “London” only should either remain in or leave the EU. If the vote had been framed in those terms there is no guarantee how “London” would have voted because Londoners would effectively have been deciding upon whether to secede from the UK – an entirely different kettle of fish. If it came to such a choice the average Londoner may well value London’s place as part of the UK more than he values a seceded London as part of the EU. Indeed, one of the reasons for the poor electoral performance of the Scottish National Party since the referendum is that they assumed too readily that the Scottish vote in the EU referendum could be treated as a proxy for Scottish independence from the UK. Of course, given the result of the referendum, places such as London or Scotland are welcome to proceed with further votes to secede from the UK if they wish to do so – even though Scotland already had such a vote in 2014 and a referendum should normally seal an issue for at least a generation. But that is completely different from saying that either region voted for “Remain” in the EU referendum. That vote was a UK vote, and the UK voted for the UK to leave the European Union. In fact, instead of incessant blubbering over the result, places such as “London” might wish to muster the humility to ask itself how it could be so out of step with the rest of the country. The standard retort to this objection is that those who voted to leave were, in fact, fully cognisant of the issues and were aware of the implications of leaving the European Union. As true this may be (and there is no particularly credible argument to assume that it is not), it misses the more fundamental point: people do not have to justify their reasons for voting the way they do. The whole point of a democratic vote is that people make up their own minds according to values which are important to them. There were a number of different issues involved in the referendum – sovereignty, democracy, culture, immigration, employment, the economy, and so on. All of these issues will be of varying importance to different voters. But people could even have voted to leave because they thought that it might free up more money for cat sanctuaries if that is what they felt was important. The point is that one person’s reasons are as valid as any other’s. The argument that people didn’t understand what they were voting for is usually premised on the patronising notion that certain issues should be more important than others – i.e. the alleged job losses and the supposedly poorer economic performance that will follow our departure from the EU. It ignores the possibility that, even if leaving the EU was to bring such economic calamities (which it probably won’t, given that smaller states are, in the long run, conducive to the flourishing of capitalism and free enterprise), people may well be willing to accept this cost in order to, say, bring back political control and sovereignty to UK shores. Moreover, it is far from clear that “Remainers” have the upper hand when it comes to judicious consideration of the “important” issues anyway. The present author has encountered several who seem more concerned with hassle free travel to the Algarve than they are with the weighty matters of political sovereignty, jobs and the economy. In fact, there is no credible evidence to suggest that “Remainers” understood all of the issues or knew what they were voting for themselves – even the more “educated” or “intelligent” ones. Most people, for instance, can probably grasp the basics of how the parliamentary system in the UK operates. In a general election you vote for your local MP; the party with a majority of MPs forms the government, and its leader becomes the Prime Minister; the government proposes legislation which must be voted into law by the Houses of Parliament. People may be unaware of the specifics, such as the difference between a green paper and a white paper, or the precise scope of the powers of the House of Lords. But the general outline is pretty straightforward, and most people – “Leavers” and “Remainers” – could probably recall it when asked. In contrast to this, can the typical “Remainer”, off of the top of his head, explain how the EU works? Can they explain who forms the European Commission, or the EU Parliament? How is legislation passed? What are the roles of the five or more presidents? Can they outline the difference between the European Union, the Council of Europe, and – just so you really tear your hair out – the Council of the European Union? The accusation that leavers did not understand the issues also comes with an assortment of other smears, such as accusations of racism and the notion that the white, older, “uneducated” working class languishing out in the provinces are “little Englanders”, hearkening back to the glories of imperial days. Actually, one of the reasons why the British public has never warmed to the EU is precisely because Britain has always had a cosmopolitan outlook, having been at the forefront of global trade for several centuries. Indeed, the latter is the very reason why the supposed benefits of the so-called “single market” and “customs union” fall on deaf ears – neither of these things can promise Britain anything that it has not achieved already by itself. The alternative of reaching out to the entire world is not a mere pipe dream – it is precisely what we used to do. The British attitude can be compared to that of, say, Germany, which has only existed as a country since 1871, and was twice defeated and demoralised within a little over seventy years. For the Germans, the opportunity to dominate a pan-European political union must surely look more attractive. In any case, regardless of all this, we must repeat the fact that all we know for sure about the referendum is the number of people who voted for “Remain” and the number who voted for “Leave”. Their reasons for doing so on the day were not recorded next to the votes. This complaint is designed to give the appearance that the “Leave” side is far from united and that “Brexit” is, in fact, a vague, umbrella term for various divisions – from the “Brextremists”, who want a completely clean break from the EU, then through various guises of Brexiteer who want some kind of residual link, all the way up to those who would remain within the so-called single market bureaucracy and the customs union. This argument is particularly ridiculous because precisely the opposite is in fact the case – nobody knows what “Remain” looks like! The requirements of leaving the EU can be summarised in a single sentence: the repatriation of decision making authority from the EU to the UK. It is from this that one derives the requirements of leaving the “single market”, the customs union and the oversight of the European Court of Justice, for these institutions and the rules governing them are the products of decision making authority in Brussels. What, on the other hand, does a vote for “Remain” actually mean? Is it a vote for just the status quo? Is it a vote to eventually join the Euro? Does it grant legitimacy to the ceding of direct revenue raising authority to Brussels, or the creation of a pan-European standing army? Is it a vote for the “ever closer union” that could result in a pan-European superstate? These questions are never asked, let alone answered. 6. There is no mandate for Brexit! This argument, peddled by the likes of A C Grayling – an arch-Remainer utterly blinded by the lefty-liberal bubble in which he languishes – is that both the turnout and the simple majority result in the referendum are insufficient to enact a major constitutional change such as leaving the EU. The usual retort to the argument is to point out that the referendum was a fairly agreed and contested ballot in which more people voted for “Leave” than for anything else in British electoral history, and that any argument used to diminish the significance of this vote applies in spades to the vote for “Remain” side, which obviously came in shorter. It is possible to have sympathy with the “Remain” argument in this instance, given that most constitutional changes in other jurisdictions do, in fact, require a qualified majority and minimum turnout. For example, while not requiring a popular referendum, an amendment to the US constitution does requires a quorum and two-thirds majority in both Houses of Congress as well as ratification by at least 75% of the states. All such sympathy flies out the window, however, once we ask the question when were the votes that took us into EU in the first place? Surely if the constitutional upheaval of getting us out requires a qualified majority vote then so too should have the equal upheaval of getting us in? 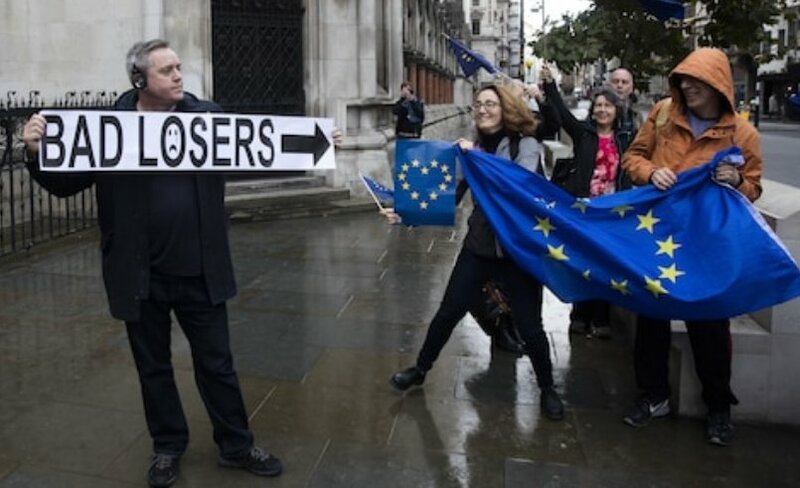 Prior to 2016, the last referendum that Britain had on the matter was in 1975, which was a vote to decide upon membership of the Common Market, then called the European Communities (EC). Although a qualified majority was not required, the “yes” result just inched over the usual two-thirds majority requirement for major constitutional changes in most jurisdictions, coming in at 67.23%. However, we never had a referendum on the subsequent deeper integration, nor on the creation of the EU itself, all of which was achieved in fewer than twenty years through the likes of the Maastricht, Amsterdam, Nice and Lisbon treaties. Several other countries did have such an opportunity to vote on these occasions but, of course, those voting down a proposal towards deeper ties were forced to revote until they gave the “correct” result. The effect of the 2016 referendum is to reset the clock. If “Remainers” wish to press ahead with a second referendum in an effort to try and scupper “Brexit” then it should be a vote to re-join the EU that requires a qualified majority. The purpose of this short essay has been to provide some more fundamental retorts to arguments from sore losers who seek to discredit the result of the EU referendum. Hopefully it will assist those of us who can’t wait to be rid of the God-awful behemoth that is the EU in getting the “remoaning” to pipe down – something which the mess and uncertainty surrounding the attempt to extract “a deal” is failing to do.